Zion Market Research has published a new report titled “Biomass Pellets Market for Industrial and Residential Applications: Global Industry Perspective, Comprehensive Analysis and Forecast, 2016 - 2022”. According to the report, the global biomass pellets market accounted for USD 7.65 Billion in 2016 and is expected to reach USD 15.9 Billion by 2022, growing at a CAGR of around 11.0% between 2017 and 2022. The global biomass pellets market is expected to witness significant growth over the forecast period on account of rising environmental awareness and government regulations. Biomass is used as a heating fuel and can be derived from various sources such as woody plants, timber industry, sawdust, sugarcane crop, and switch grass. 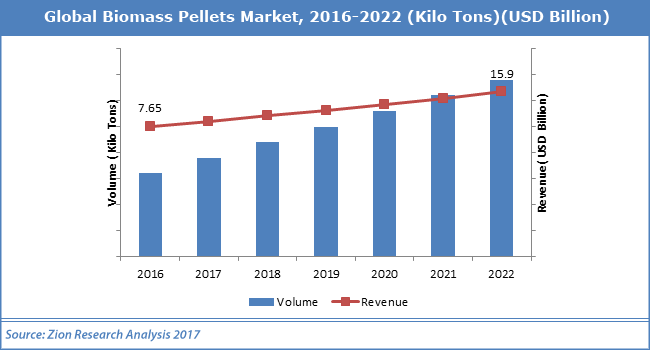 The growing disposable income and the consequent demand for nonconventional sources of energy are expected to drive the demand for biomass pellets market within the forecast period. Furthermore, the rapid depletion of fossil fuels and global warming are expected to aid the growth of biomass pellets market. However, the raw materials and the extraction process are expensive. This could restrain the growth of the biomass pellets market over the years. Industrial applications segment dominated the biomass pellets market with a major share of total volume consumed. Low greenhouse gas emission and various governmental regulations have paved the way for the industries to adopt biomass pellets for heating fuel. Residential applications segment is expected to experience growth within the forecast period owing to increasing environmental awareness. In terms of geography, Europe was the largest market for biomass pellets in the world due to the low GHG emissions and increased government initiatives for the adoption of renewable technologies. Moreover, biomass pellets market has huge opportunities in the emerging markets of Asia-Pacific region due to the government regulations shifting the focus on adopting non-conventional energy sources such as biomass. Some of the key players included in biomass pellets market are Energex Corporation, Forest Energy Corporation, Helius Energy, New England Wood Pellet, Woodstone, Forth Energy, International WoodFuels, and MGT Power among others.